"Barefoot In The Park" takes place May 4-6, and May 11-13 with Friday and Saturday shows are at 7:00 pm and Sunday shows are at 2:00 pm. Admission is $15 adults, $10 HHOH members, $5 students 17 and younger. Tickets are available by calling 605-584-2067 or in person at the office in the back of the building. "Barefoot In The Park" is sponsored by annual members, KEVN Black Hills Fox TV and the SD Arts Council through the SD Dept. of Tourism through the National Endowment for the Arts. May 4, 2018 - May 6, 2018 Friday and Saturday shows are at 7:00 pm and Sunday shows are at 2:00 pm. May 11, 2018 - May 13, 2018 Friday and Saturday shows are at 7:00 pm and Sunday shows are at 2:00 pm. 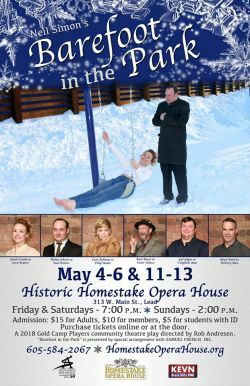 Gold Camp Players Present "Barefoot in the Park" at the Homestake Opera House, a romantic comedy play by Neil Simon. Friday and Saturday shows are at 7:00 pm and Sunday shows are at 2:00 pm.